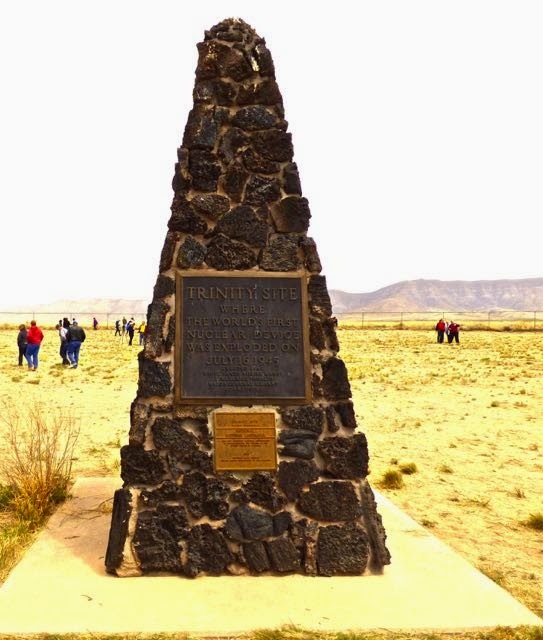 Today we drove to the Trinity Site which is around 2 1/2 hours NW of Alamogordo via Hwy 54 and 380. 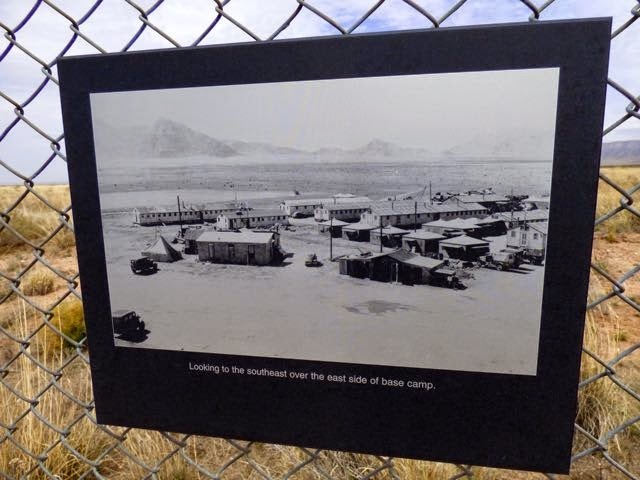 The site is only open to the public on the 1st Saturdays of April and October. Upon reaching the turnoff to the Stallion Gate it was another hour to the gate due to heavy traffic and another 16 miles to the parking area. 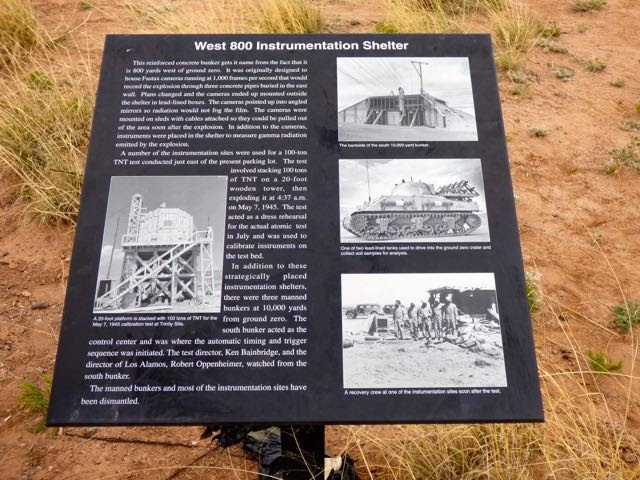 Be prepared to have Photo ID when entering the gate as this is a military installation. 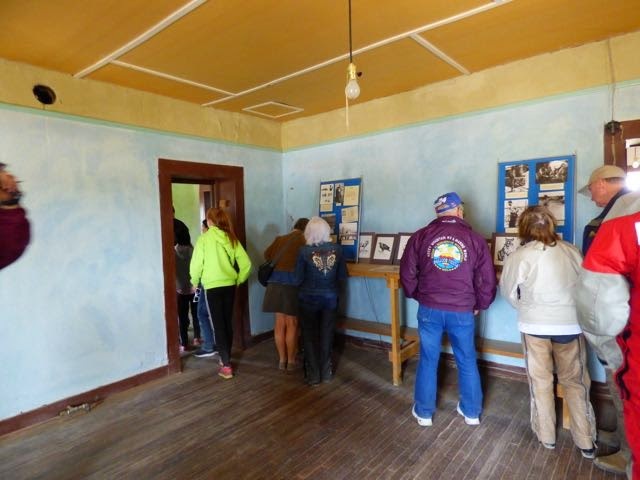 The site is 1/4 mile walk or you can hop a ride on the jitney.After touring the site, a bus takes you to the George McDonald Ranch. 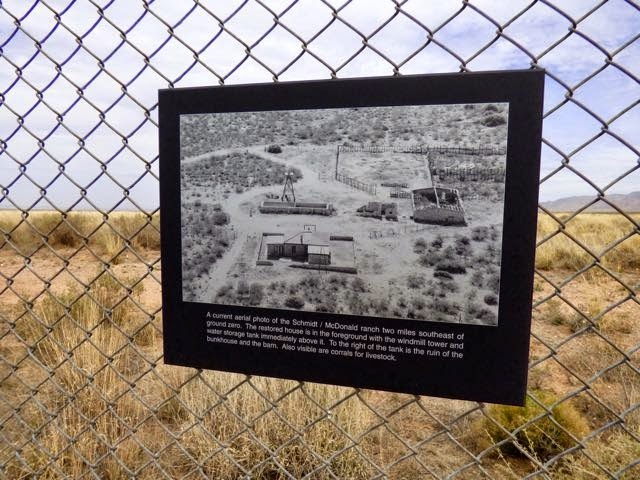 As you know, this is the site of the first detonation of an atomic bomb 16 July, 1945. All that remains is the monument. 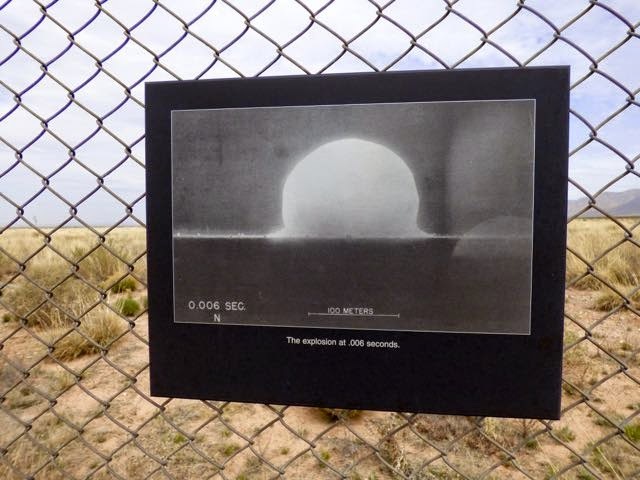 There is signage on the fence showing what the site looked like and time released photos of the detonation. 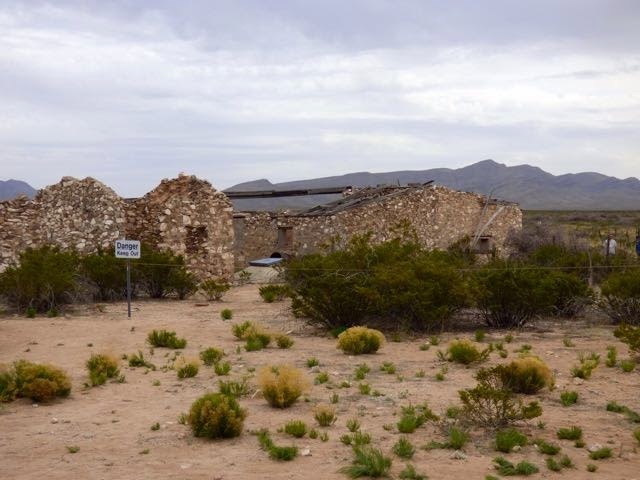 Also on the site is a structure that houses the Trinitite (radioactive green glass). 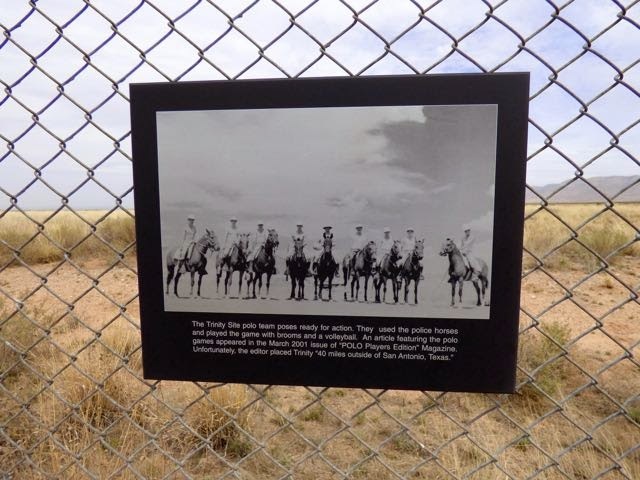 You cannot collect samples of the Trinitite under Federal Law. 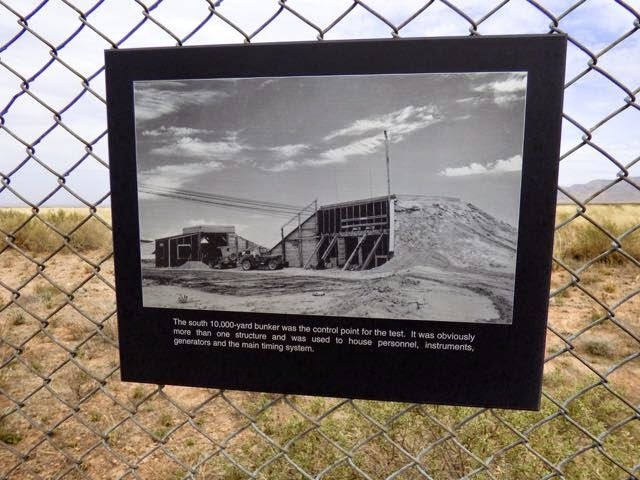 The site is part of the White Sands Missile Range. 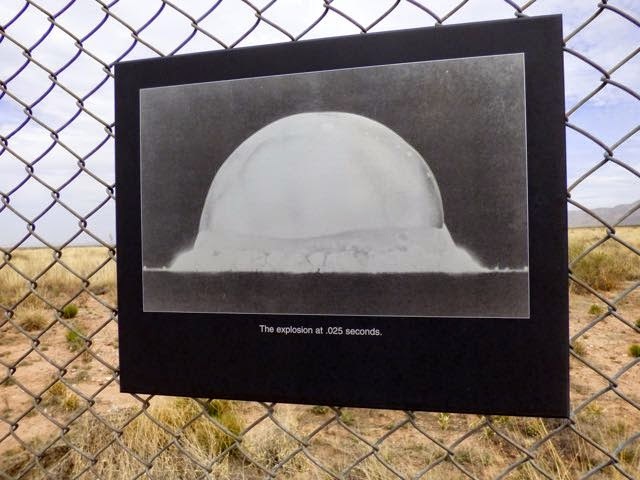 Los Alamos scientists devised two designs for an atomic bomb. One using Uranium and the other using Plutonium. 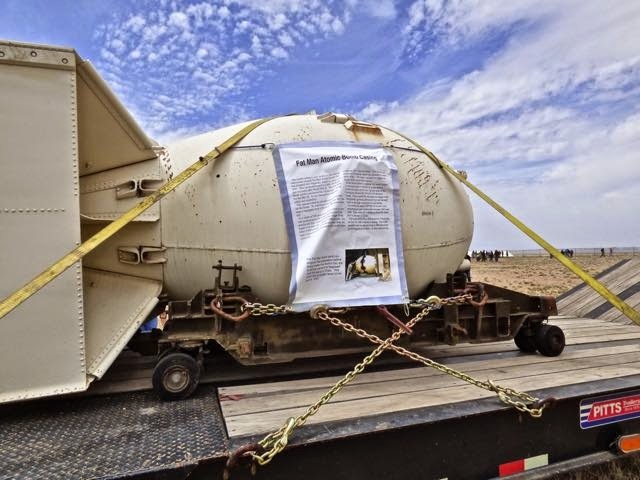 The Uranium bomb was a simple design and scientists were confident it would work without testing. 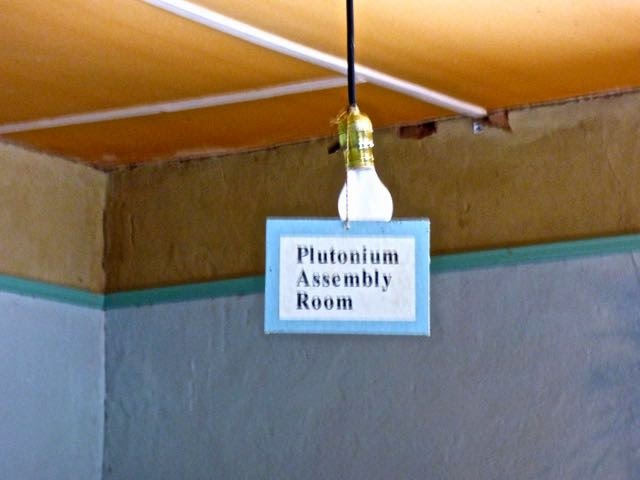 The Plutonium being more complex needed to be tested before use in war. 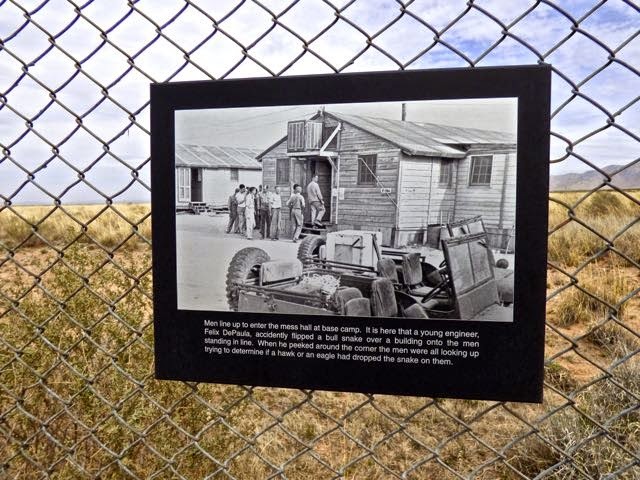 Soldiers started arriving at the site in 1944. Recreation at the site included hunting,volleyball and polo played with a broom and volleyball. Deer and Pronghorn harvested provided food. Some of the soldiers from the city thought scorpions were crawdads. 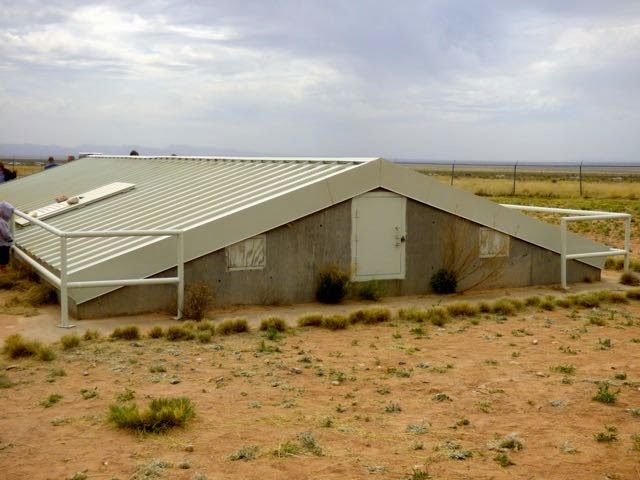 Junbo was built to prevent the Plutonium from being lost in the event of a failed explosion. As confidence grew, it was decided not to use Jumbo. Jumbo was placed 800 yards from ground zero. The blast destroyed the tower, but Jumbo survived. 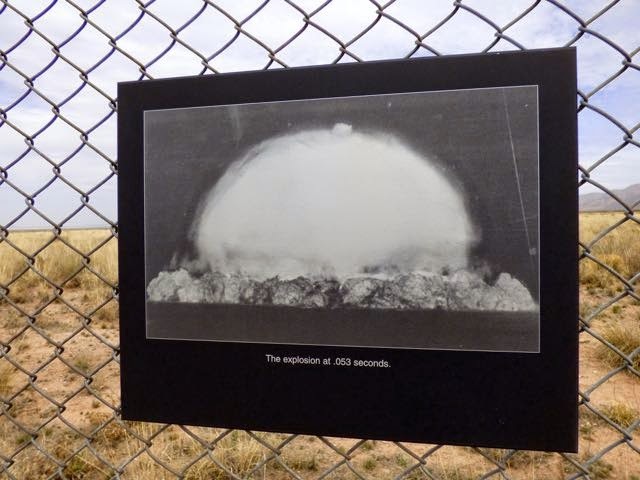 In 1946, the army detonated eight 500 lb bombs inside which blew off the ends. 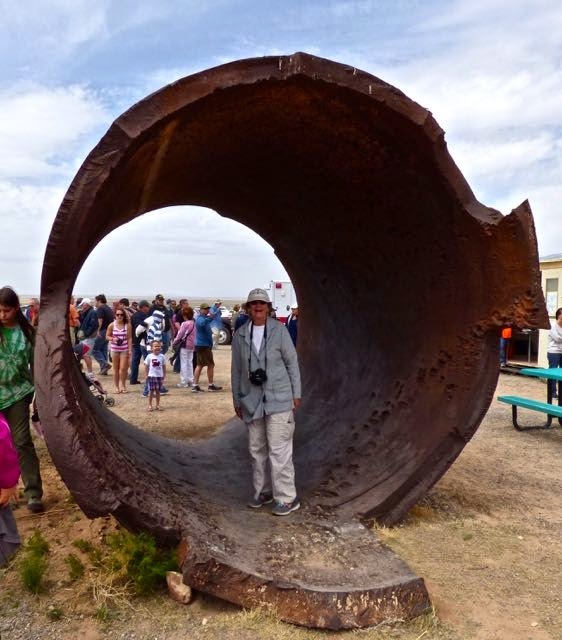 It now stands at the entrance to the site. 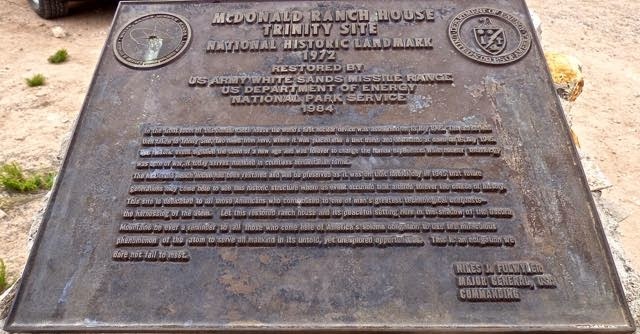 The assembly of the plutonium core took place at the George McDonald ranch house. 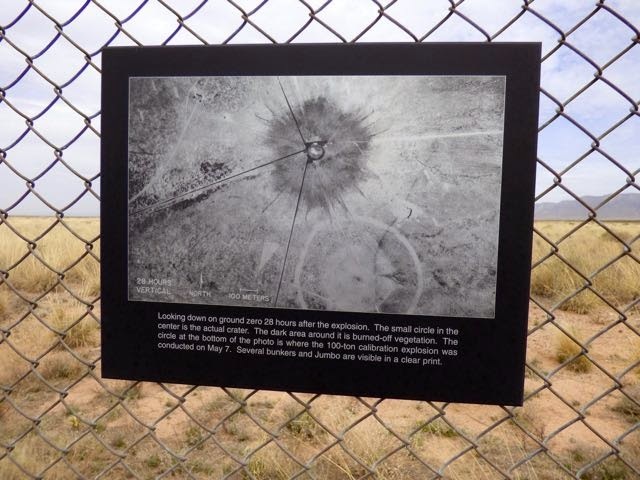 On the 13th the core was taken to ground zero for insertion into the bomb. 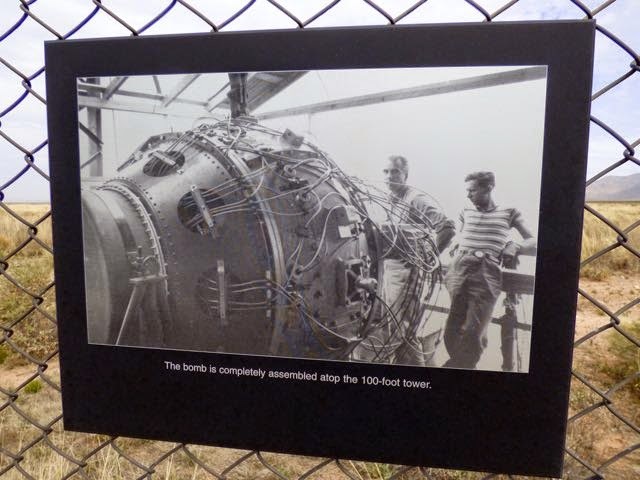 The next morning the entire bomb was raised to the top of the 100 ft steel tower. 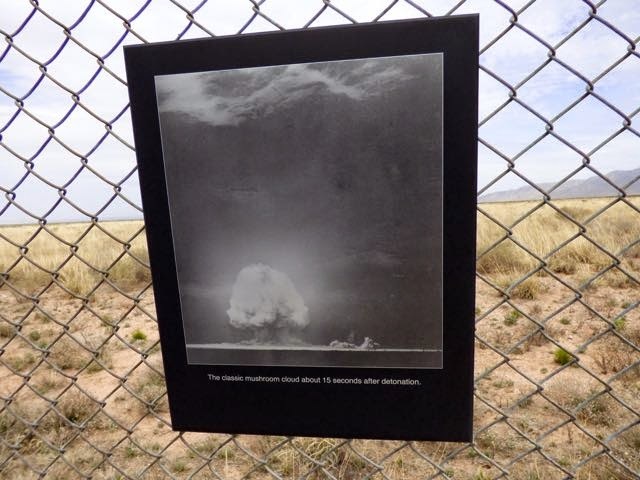 The bomb was not dropped from the tower. The tower was vaporized in the blast. All the buildings were removed after the test. 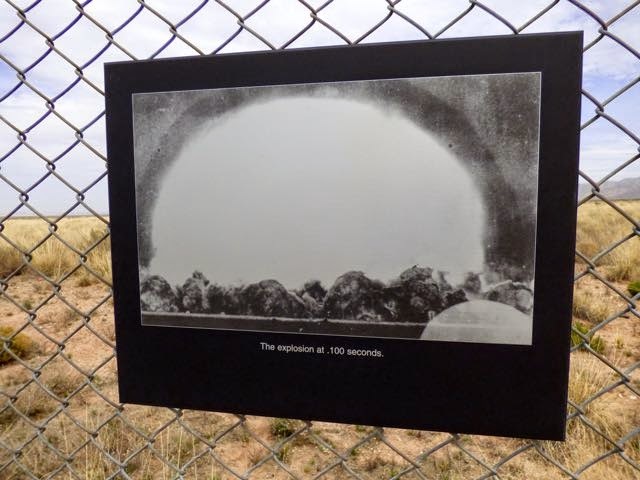 the shock wave broke windows 120 miles away and felt 160 miles away. Army officials stated that a munitions storage area had exploded. 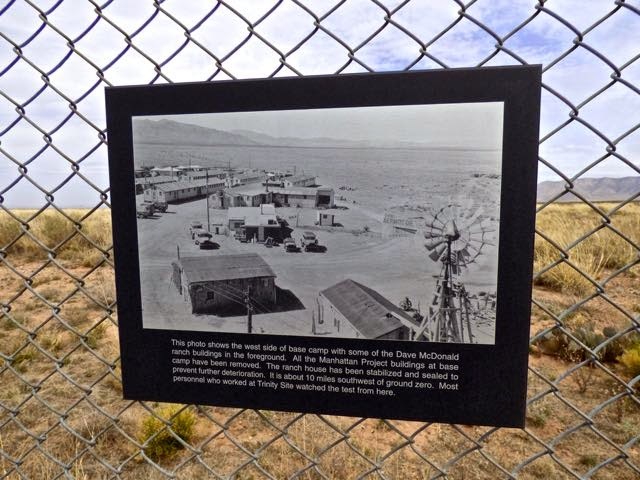 The heat melted the desert sand and turned it into a green glassy substance which they named Trinitite. 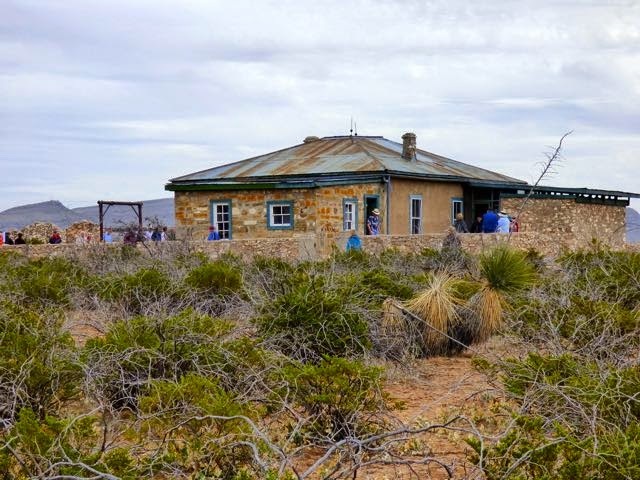 The George McDonald ranch house was built by Franz Schmidt in 1913. An addition was added by McDonald in the 1930's. 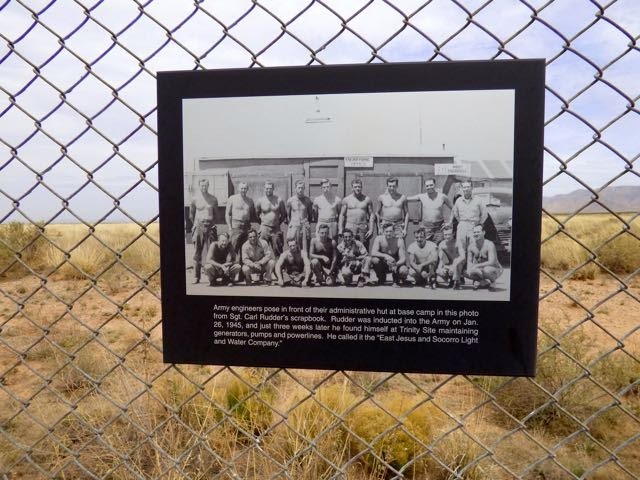 The ranch was abandoned in 1942 when the Alamogordo Bombing and Gunnery Range took over the land for WW II training. The master bedroom was the assembly room. Surprisingly, the blast did not damage the house which was two miles away. The house stood empty until 1982 when the Army stablized the house to prevent further damage. 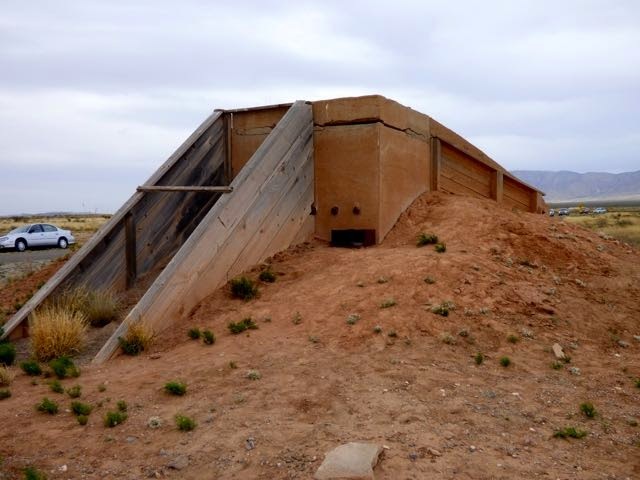 The land today is under control of the rocket and missile testing facility. We are glad we decided to visit the site. Gives a better understanding of the happening.